Hello there! Yes I am still here even though I haven’t posted for most of January. January is my busiest month at work and now that it’s ending, I am starting to crawl out of my office and rejoin the rest of civilization. Last night my family got together to celebrate my siblings’ birthdays this week. I am still on a dairy-free diet so I brought along an “Amy-friendly” dish to share. It was very easy to make so I thought I’d post about it. Heat oil in a 2 quart stockpot over medium-high heat. Cook onion until soft. Add quinoa and salt and pepper and cook a couple minutes more, stirring to coat quinoa. Pour in broth or water plus bouillon. Add chickpeas and cranberries. Bring to a boil, then reduce heat, cover and simmer for approximately 20 minutes or until water is mostly absorbed. While quinoa is cooking, toast almonds in a dry skillet until fragrant. Toss with quinoa and serve. I thought it turned out great and I’m looking forward to the leftovers for lunch today. Looks delish. I can’t wait to try it. 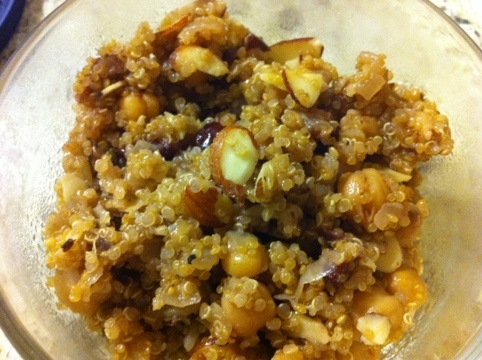 I love cooking with quinoa, and this looks like a very interesting recipe. My kids will love it!